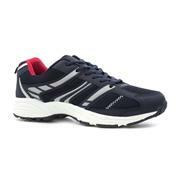 A pair of quality men’s trainers won’t just serve you well at the gym – they’ll be great for casual wear, too. Here you’ll find examples that look and feel good enough that you can wear them wherever you might want to go, including shoes from big-name brands like Puma and Hi-Tec. 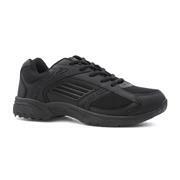 Whatever your budget and taste, we have a trainer to team with your sportswear. If you’re looking to play football on grass, then a pair of studded boots is a requirement (slipping won’t just harm your game, it might cause injury). Likewise, if you’re a committed jogger, you’ll need a pair of shoes that’ll support your feet and keep blisters and muscle pain at bay. 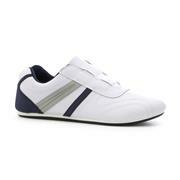 The trainers here are available in a host of different sizes – so be sure to pick one that suits your feet. If you’re looking for a more versatile pair of mens trainers that’ll you’ll be able to wear casually then you’ll find them here, too – in a range of different colours and styles. 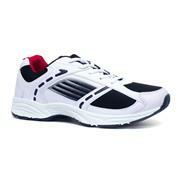 Choose a men’s lace-up trainer for sport or fitness, or select a casual easy-fasten style for day to day wear. Like all of the cheap men's shoes in our catalogue, these come at very reasonable prices – and they can be delivered right to your door for free. 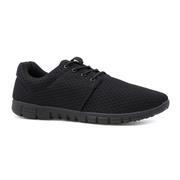 So, whether you’re looking to get fit or get fashionable, you’ll find a suitable pair of trainers at a suitably cheap price right here. 61 products from £9.99 to £69.99.